Called Nokia Asha 309 and is a new member of the Asha collection, intended for a group of users who want to get hold of a mobile phone touch basic range, without the need of having to choose sides or more complex solutions. In this sense, the Finnish company Nokia has wanted to continue backing provide a simple but equipped with the operating system running lifetime, Nokia Series 40 but with a renewed interface named Asha Touch, Touch focus sharply. The device comes equipped with a generously sized touch screen when compared to the other terminal of signature. Its design is elegant and very reminiscent forms the latest Symbian phones with the firm wanted to give to your loyal customers. Because the Nokia Asha 309 is a mobile phone of a lifetime. It seems especially designed for those who want to continue backing the Nokia brand. And indeed, as we face the operating system and the inner workings in general, we see that everything is very familiar. Not a great device designed for high performance multimedia. In fact, your camera only has a two-megapixel sensor, a detail that could be disadvantageous for many users who ask for a little more. In short, the Nokia Asha 309 is designed for those who want to use their mobile phone to call but, occasionally, they want to use to connect to the Internet and enjoy the benefits of the online world. Here, we present a thorough analysis with photos and reviews. The Nokia Asha 309 is a generously sized device. Complies with dimensions of 109.9 x 54 x 13.2 mm and weighs about 102 grams with the battery included. It is true that this is a phone a little heavier than usual, probably due to the materials it is made. In any case, on the metal housing of the apparatus we encounter a capacitive multi-touch screen of 3 inches with a QVGA resolution of 200 x 400 pixels. It is a screen that could be described as small compared with other more advanced terminal panels, but the truth is it has a more than generous size for a phone as basic as would become the Nokia Asha 309. The result is a surface large enough for normal use without problem can handle the calls, email and to navigation. The device comes to market with a two-tone metal case: a darker gray and a smoother, in what would be a rather discreet bet by Nokia, which this time has decided to park the bright colors. The connectivity of this Nokia Asha 309 is somewhat limited. To begin, we must indicate handset operates on GSM / EDGE Dual Band GSM 900/1800 and GSM 850/1900, as well stated in the technical officer. It supports 2G, but not 3G, so that those who were willing to choose a good connectivity will have to look at other proposals. Thus, it is confirmed that the Nokia Asha 309 is made ​​for a user who wants to simply connect a timely manner, but do not intensively. Luckily, the terminal gets along with wireless networks, so you'll have no problem when the wireless connection to tap your home or your work. Beyond these vital connections, the terminal also supports Bluetooth 3.0 and various online services such as Nokia Maps, Nokia Chat, Windows Live Messenger, Yahoo! Messenger, Google Talk or instant messaging Nokia Messaging. In the area of external connections, the Nokia Asha 309 is an entry microUSB 2.0 points we find it useful to charge the device for sound and data transfer, plus a Nokia AV connector 3.5 mm headphone . Those who want to expand the terminal's memory may also do so via a microSD card slot. As mentioned earlier, the Nokia Asha 309 is very equipped in the photographic section. In fact, only has a two-megapixel camera that offers a lot of leeway. Snapshots can have a maximum resolution of 1600 x 1200 pixels and little more. He says, yes, the ability to record QVGA video (176 x 144) at 10 fps @, albeit at a fairly low quality. In any case, the camera function is purely testimonial and respond to very specific times of need. If the user was looking for a camera for wider, better go looking at other options within Nokia, which are very varied. In the media there are no surprises. The machine will support the following formats MIDI, AAC, AMR-NB, AMR-WB, Mobile XMF, MP3, MP4, M4A, NRT, WAV, SP MIDI, WMA, WMA 9, AAC LC, GSM FR, WMA 10, WMA 10 Pro, a-law, mu-law, .264/AVC, MPEG-4, WMV, 3GPP formats (H.263), VC-1, GIF89a, BMP, GIF87a, WBMP, EXIF, PNG, DCF, JPEG , so you should have no problem when playing videos, photos and music from the terminal. Additionally, it must be said, consists of R adio FM stereo, FM audio recording, JAVA games and speaker. As you can imagine, the Nokia Asha 309 memory can not be extended in any way. As entry-terminal, has 64 MB internal storage which we suffice to four files, music tones and messages. If we make greater use of the device, of course, it is best that we expand capacity. We have the option to do so easily through a memory card, and up to 32 GB. The terminal already has a slot specially equipped for this purpose. This allows us to store large amounts of audio files, photos, songs and even some other application that can resultarnos interesting. 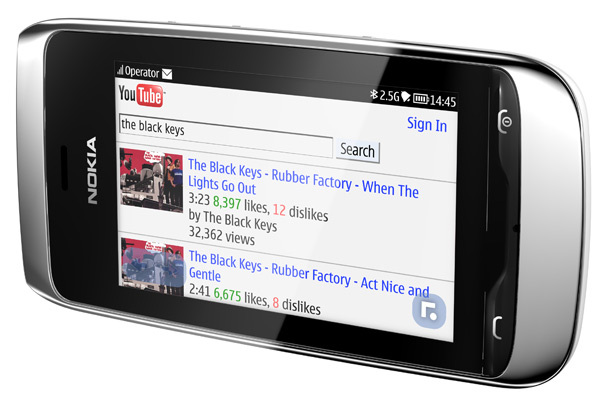 The selected operating system is Symbian for the occasion, one of the most common platforms for Nokia users. In fact, virtually all cell Asha make use of it. Here, according to tradition, the Nokia Asha 309 runs through Series S40 and comes topped with Asha Touch interface for touchscreen terminals. You will see that the system is very similar to the last Nokia Symbian presented so that the user will feel at home in this device menu. We can download applications through Nokia Store. In fact, this is the best approach when using social networks like Facebook , Twitter or other sites might be useful tools through connectivity. 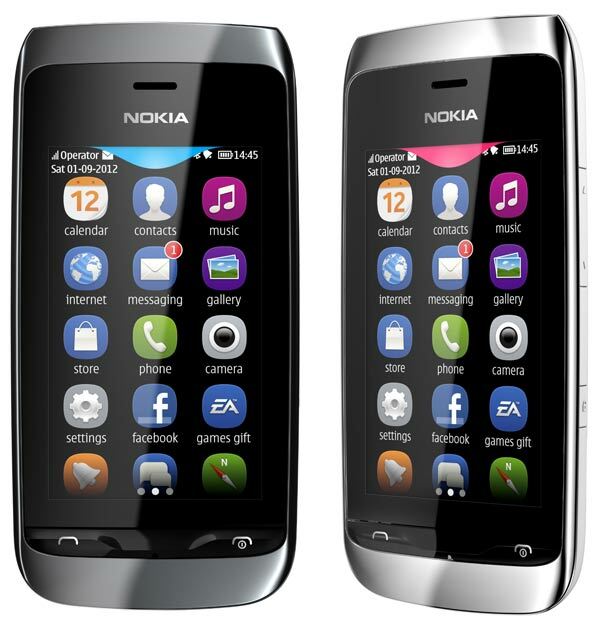 The Nokia Asha 309 has an integrated lithium ion battery with a capacity of 1110 milliamps. This is a basic tool, according to the performance of the terminal, so we should notice a performance provided. 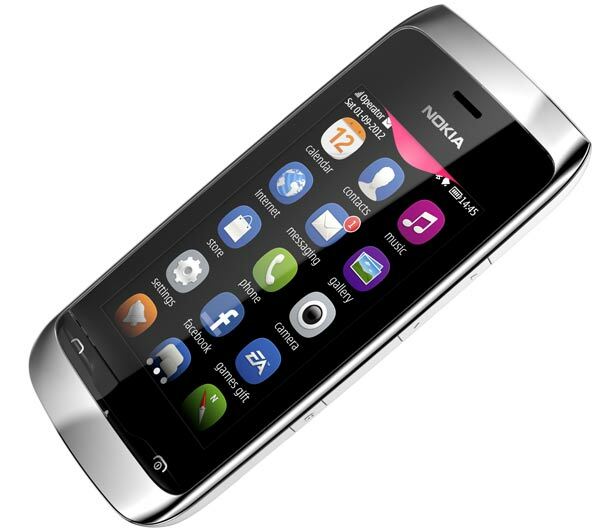 According to the SPC of Nokia itself, the Nokia Asha 309 can support up to 6 hours talk time and 650 at rest. These results should be tested through normal use, since the experience can be changeable depending on the state of the network and the actual use that every user of the phone in question. 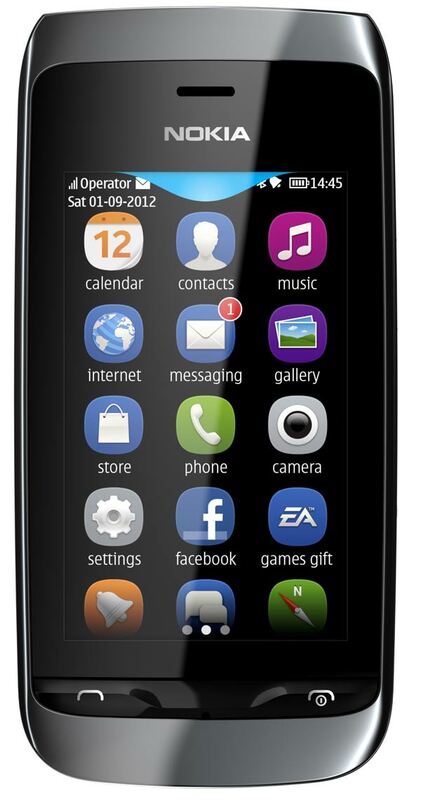 Availability, Nokia has announced the Nokia Asha 309 will be in stores soon. In fact, it will do the fourth quarter of 2012, without specifying an exact date for the various markets. We know it will be sold in Spain, but Spain has not Nokia realize how dear will be launched and what exact price will. Around the world will have an approximate price of $ 99. Supported formats: MIDI, AAC, AMR-NB, AMR-WB, Mobile XMF, MP3, MP4, M4A, NRT, WAV, SP MIDI, WMA, WMA 9, AAC LC, GSM FR, WMA 10, WMA 10 Pro, to -law, mu-law, .264/AVC, MPEG-4, WMV, 3GPP formats (H.263), VC-1, GIF89a, BMP, GIF87a, WBMP, EXIF, PNG, DCF, JPEG.